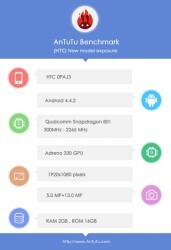 A mysterious HTC device with high-end specs made an appearance in the AnTuTu benchmark database. Carrying the model number 0PAJ3, the mysterious handset could be a successor to the HTC Butterfly S.
Listed specs of the HTC 0PAJ3 include Qualcomm Snapdragon 801 SoC, Adreno 330 GPU, 2GB of RAM, 1080p display, and 16GB of built-in memory. The OS is Android 4.4.2 KitKat. Curiously, the yet to be revealed device appears to have a conventional 13MP main camera instead of the UltraPixel camera of the HTC One (M8). The front-facing snapper is a 5MP unit. There are no available announcement or availability details on the HTC 0PAJ3 for the time being. We hope it will not be a long wait before we get the full scoop on the device.